El Escorial and El Valle de los Caidos are both popular day trips from Madrid and are usually visited together. Of all the guided tours you could consider from Madrid, this one is easily the best. Because of the awkward logistics of combining the two sights, a tour that takes you to both makes the most sense. You can even add in Toledo for a really full day! Take the 664 or the 661 bus from Moncloa Bus Station. The 664 is quicker. Take line 8 of the Cercanía (local train) from Atocha, Chamartin, Nuevos Ministerios or Recoletos (on Paseo Castellana, near Gran Via). If you're relying on public transport, you need to go via El Escorial. There is one bus a day that goes all the way to the monument. It leaves from El Escorial's bus station at 3.15pm and returns at 5.30pm. The ticket costs around 15€ and includes the return journey and entrance to the memorial. Co-ordinating your visit to El Escorial with this bus in a day trip is very difficult - I failed on my first attempt. There is no direct train from El Escorial to Segovia, but it is possible to make the journey with one connection, at Villalba de Guadarrama. Travel time by train is just over one hour, plus transfer time. There is no need to buy in advance, but you can book from renfe.es. Visit the spectacular monastery, Monasterio de San Lorenzo del Escorial. See the Crypt in which the majority of the Spanish Kings are buried, from Charles I (who died in 1556) through to Alfonso XIII (died 1931) through Philip II, Philip III, Philip IV, Charles II, Louis I, Charles III, Charles IV, Ferdinand VII, Isabel II, and Alfonso XII. To complete your tour of deceased Spanish rulers, General Franco (the dictator who ruled Spain for much of the twentieth century) is buried in the Valle de Los Caídos. Transport to El Valle de Los Caídos is difficult, so it is advisable to take a guided tour of El Escorial and El Valle de Los Caídos. See the final resting place of Spain's former dictator, General Franco, who ruled Spain from 1939 until 1975. Combines perfectly with half a day in El Escorial, where most of Spain's other rulers are buried. 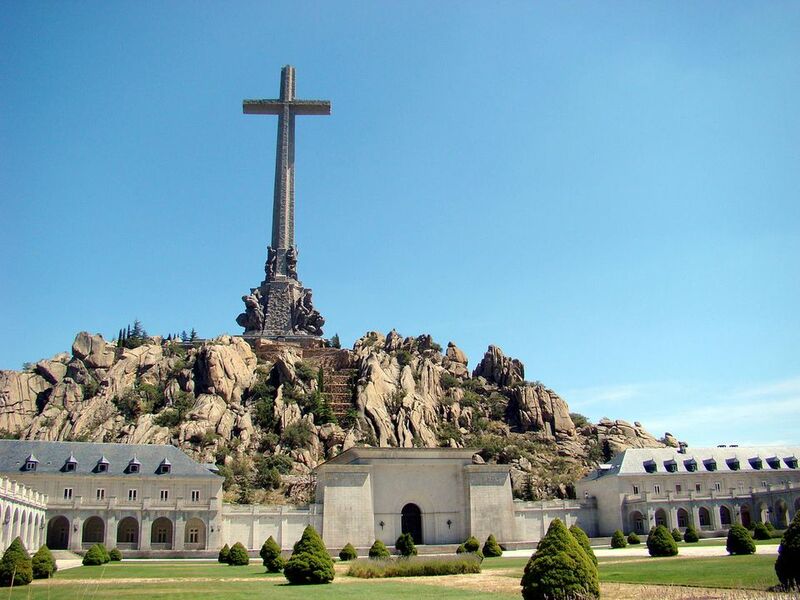 See the controversial stone cross and basilica—the monument was built by Franco's prisoners of war after the Spanish Civil War. Entry into all of these activities is free with the Madrid Card.